In the Fall of 2017, NITECORE began introducing camera battery chargers to our line up of high quality charging products. With these chargers designed to meet the needs of busy photographers at home and on the road, we’ve been quietly expanding the models and brands supported ever since. If you’re looking to supplement or replace your existing charger, you won’t go wrong with these lightweight, USB compatible alternatives. Keep reading to see why choosing NITECORE makes a difference. It doesn’t matter if you’re shooting with a Sony or Leica camera, all of our camera battery chargers include the same standard features that set us above the competition. You’ll always know the charging progress of your battery and other important information thanks to a brightly lit and easy to read digital display. Finding power wherever you go is easier than ever with an included USB charging cable with every model. Use the cable with power banks, solar panels and laptops for USB powering or pair your charger with an AC adapter for traditional wall charging. All of our camera battery chargers are constructed from flame-resistant PC materials and take up minimal space in your camera bag. With most chargers weighing around 2 ounces, chances are you won’t even notice it’s there! This year, NITECORE has upped the game and introduced the PRO upgrade to their newest releases. Featuring the same intelligent charging capabilities as our standard models, the PRO editions contain a few extra goodies to make them even better than ever. 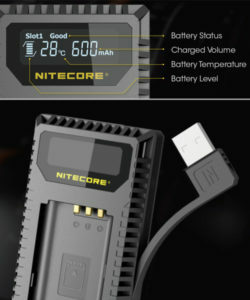 It wouldn’t be PRO without improving the charging speeds, and NITECORE has done just that! PRO camera battery chargers push the max charging speed from 1A to 1.2A so you’ll spend less time charging and more time capturing the moments that matter. Although we love the convenience of the stowable USB cable on the standard edition, NITECORE realized many users needed the ability to have a longer cable. The result: PRO editions include a removable USB cable that tucks into a groove along the bottom to prevent sliding. And even though the new included cable is much longer than before, you can supply your own to get the exact length you need! 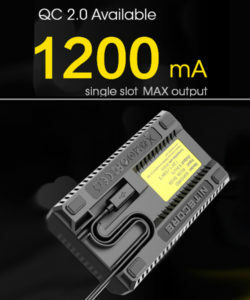 Wondering if it’s safe to use a 3rd party charger for your camera batteries? The answer is yes! All of our charging products come standard with built-in safety protections to keep you and your gear safe from overcharging, overheating and short circuits. NITECORE is known around the world for our high quality li-ion battery charging products including the wildly popular i2/i4, D2/D4 and SC2/SC4 models. Our chargers are all designed to intelligently and safely charge your batteries so you can stay powered wherever your travels take you. The same quality that flashlight users and vapers have come to expect is inherent in our NITECORE camera battery chargers. Maybe we don’t support your favorite camera model yet, but give us time! NITECORE has been dedicated to adding support for many popular brands and models and shows no signs of stopping any time soon. Below is a complete list of our digital camera chargers to help you find the right one for your camera.